THIS ARTICLE WAS ORIGINALLY WRITTEN FOR THE VELVET ONION. AN ALTERNATE, SHORTER REVIEW WITH LESS EMPHASIS ON PRIOR KNOWLEDGE OF THE BAND WAS ALSO WRITTEN FOR MUSIC NEWS. Earlier this year, we told you all about Sticky Wickets – the second album from art rock band The Duckworth Lewis Method. As with their 2009 debut, the record featured the vocal talents of Matt Berry, whose groin also graces the inside cover and subsequent merchandise on sale now. That the record also happens to be one of the finest albums we’ve heard all year is no surprise, given that TDLM are in fact a combination of two of Ireland’s finest – Thomas Walsh of Pugwash (who recently toured with Berry), and Neil Hannon of The Divine Comedy (and of course, the theme music for Father Ted and The IT Crowd if you need a further TVO connection). Musically, the album was gloriously archaic – a timewarp to the 1970s and 80s with ELO, 10cc, The Beach Boys and even Art Of Noise references jostling with trad. jazz influences, spoken word interludes from big name celebs (Stephen Fry & Daniel Radcliffe, anyone?) and glossy production. That symphonic baroque fusion, with lyrics focused on that last bastion of English sporting tradition – wonderful, glorious cricket – could have been hard to pull off live, yet the incredible talents of Hannon, Walsh and fellow Pugwash refugee Tosh Flood ensure that’s never going to be the case. Crammed onto the tiny stage of Manchester Academy 3, the band are dressed in typically cricket-inspired attire, attempting to defy the heat of the stage lights and the small but packed out venue with a variety of hats, scarves and cricket whites. Thomas Walsh takes centre stage, acoustic guitar slung over his mighty shoulders, flanked by Neil Hannon on his right and Tosh Flood on his left. Instantly, the camaraderie between them is apparent: they may look gimmicky writing songs about cricket, but they love the game and they love one another, and it shows. Blasting their way through most of their two albums, the band are on fine form throughout, and intersperse the tracks with audience interaction and chit-chat that out-does most live comedy shows in terms of laughs per minute. The evening also acts as an opportunity for Flood to shine. 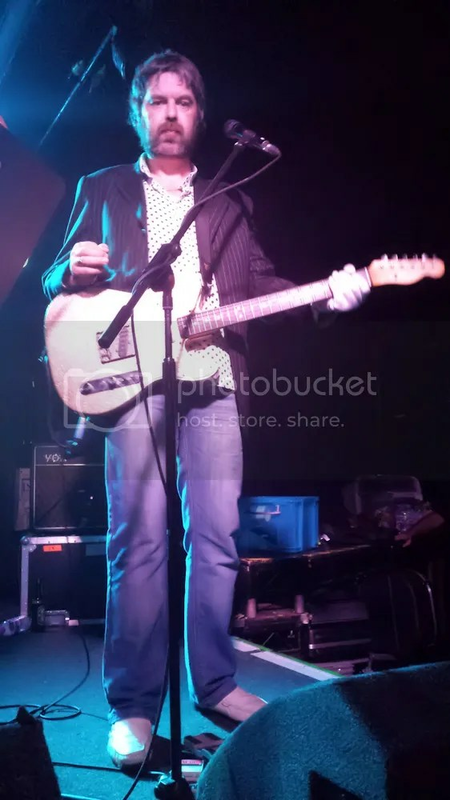 After an early microphone mishap causes a roadie to distract the audience from his foot on the speaker rock guitarist stance, Tosh makes his mark with daft comments and an impromptu rendition of The James Bond Theme. Yet it’s his beautiful guitar work that resonates after the show just as much as his tales of late night shopping for Wotsits. As for Hannon, it’s becoming increasingly rare to see the mastermind in his element on stage, and it’s a delight to get that opportunity in such an intimate venue. As typically charming and eloquent as one would expect, he’s also incredibly self-demeaning – particularly when he simply cannot remember the words to Jiggery Pokery, and lets the song descend into a hilarious running commentary of how a cricketing legend may possibly murder him one day. Besides this little mishap, the tunes are note perfect all night long, and the frivolity on stage keeps the crowd energetic and surprisingly pleasant, even when faced with improvised reworkings of songs by The Smiths and James Blunt in the name of comedy. It’s an incredible, feel good vibe that only comes from musicians at the peak of their game – talented enough to have the song-legs to stand on, but human enough to leave egos at the door and just have a damn good time. It’s quite common to walk out of a gig and feel elated, but less frequent to still have that feeling the following day. Even rarer, is that wish you were going to back and do it all again the following evening, but after a few hours in the company of Duckworth and Lewis, you’d be hard pressed not to. Splendid. 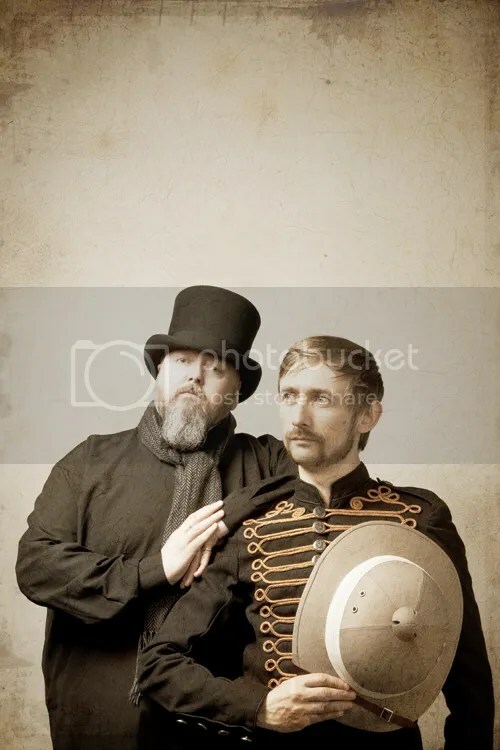 The Duckworth Lewis Method are currently on tour, with dates in Leeds, Bristol, Birmingham, Dublin and Belfast still to come. For more info, visit their website. 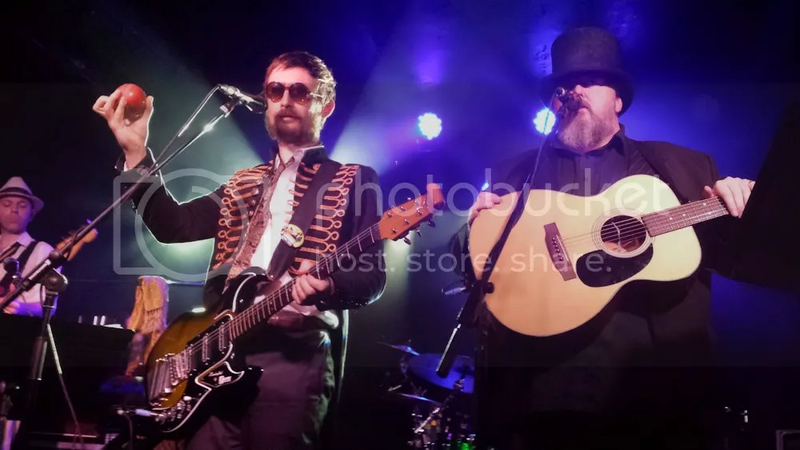 Their albums – The Duckworth Lewis Method and Sticky Wickets – are both available now via The Velvet Onion Amazon UK Store. Posted on October 1, 2013, in Reviews. Bookmark the permalink. Leave a comment.